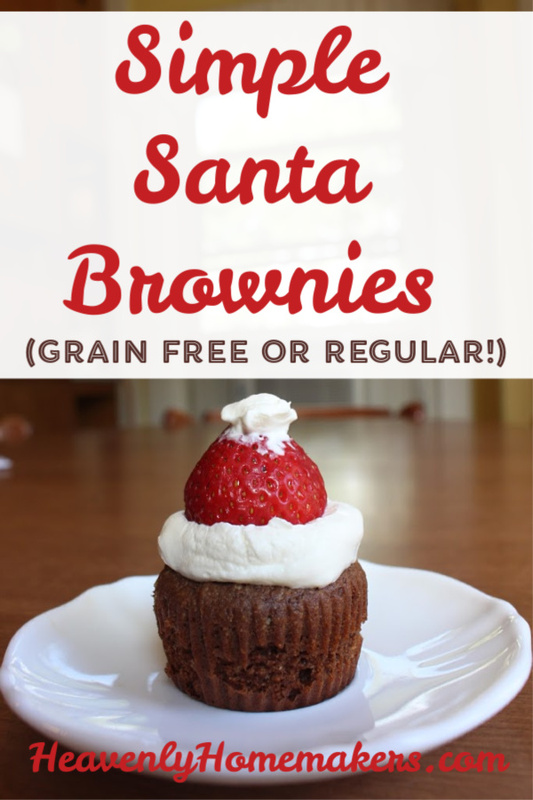 I found this idea for Simple Santa Brownies and decided that surely I could make a healthier version of them. I was not wrong. I was very right. And come to find out, Santa is very, very delicious. Now obviously, you can take this idea and go with it no matter if you’re using a boxed brownie mix or a healthier brownie recipe. But I loved the idea of using my Super Moist Flourless Brownie Muffin recipe for this! It turned out fabulously. Finding good strawberries this time of year is a little bit tricky, I realize. But for the sake of creating these awesome treats, I think it’s worth your purchase. It’s probably also worth noting that if I can make these, anyone can make these. I’m no decorator. I rarely try to make cute food because I know I’m not good at it. But whipped cream and strawberries win the prize on these. Who knew real food could be used to decorate a fun Christmas treat! I’ll repost my flourless brownie recipe for you here. But if you want my full sugar, full flour recipe, you’ll find it here! Stir all ingredients together until well combined. Scoop batter into 9 paper-lined muffins cups. Whip cream and stevia or sugar until stiff peaks form. 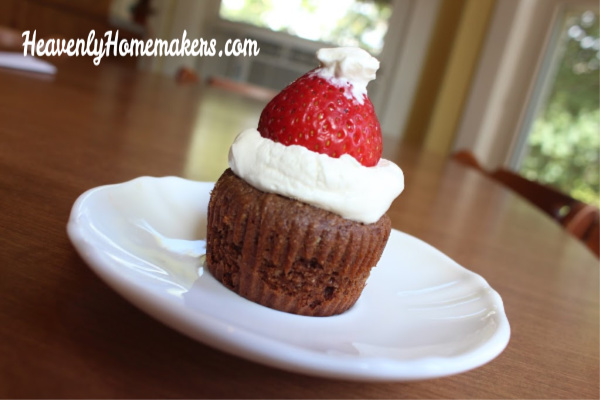 Once brownie muffins have cooled, top them with whipped cream and a strawberry. Top the strawberry with a "snowball" of whipped cream. What’s your favorite brownie recipe? I am a wheat eater and a gluten consumer. I use freshly ground flour several times each week. Even so, I love making Flourless Treats for a change of pace. After all, we all get plenty of grains in our diet. Making treats that are flourless is a great choice for all of us! The beauty of this list of Flourless Treat recipes I’m sharing is that every single one of them tastes like something special. These recipes don’t include weird ingredients that make them seem “healthy.” Not that any of us are opposed to eating healthy, of course. 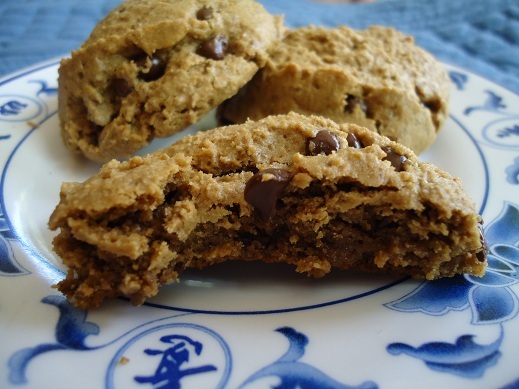 It’s just that some healthy treat recipes are strange and awkward and leave the consumer wanting an actual cookie that isn’t made with banana paste and finely ground chicken feathers. Or some such. So please, my friends. Enjoy the following delectable recipes that no one will suspect to be “out of the norm.” All will eat these and be delighted. They will share them with their friends, saying, “Hey, you’ve got to try this cake!” Meanwhile, over in the corner, you will be chuckling over the fact that once again, you pulled off the “I made treats without flour in them and nobody suspected” trick. Not that we’re trying to be tricky. I mean, we can’t help it if our healthier food tastes just as good if not better than their less healthy counterparts. There’s nothing we can do about this. Making great food in healthy ways is simply what we do now. We can’t even help ourselves. P.S. 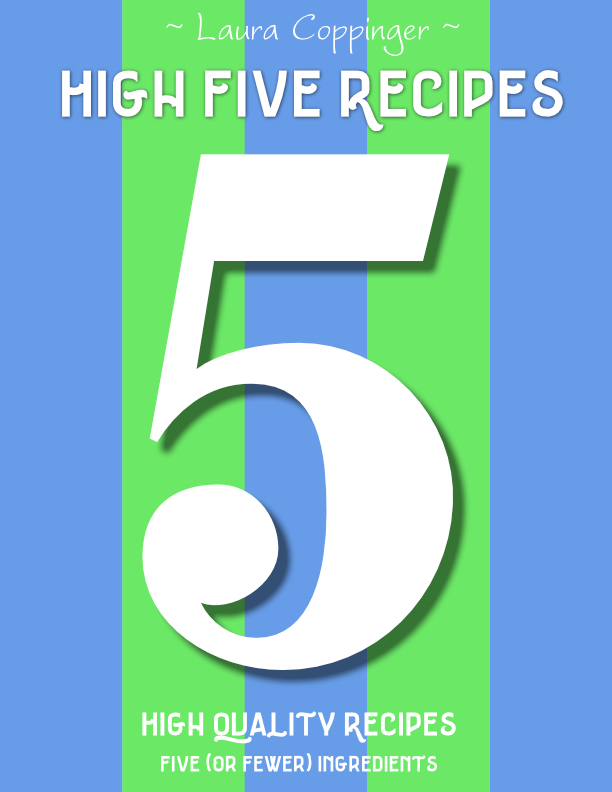 Every single recipe on this list is a perfect choice to make for your friends and family members who eat Gluten Free. Only beware of the recipes which include oats, making sure to use GF oats! 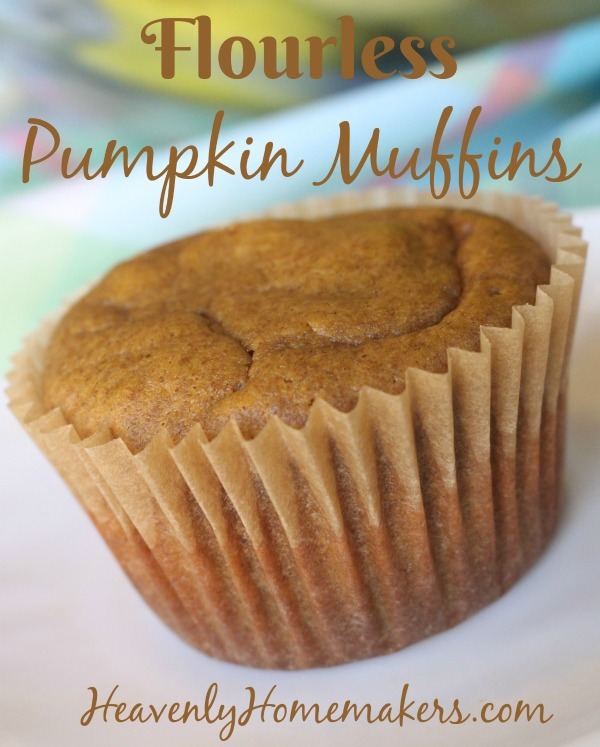 What’s great about these muffins, besides the fact that they are flourless and deliciously pumpkin-y is that they are also filling and super nourishing. 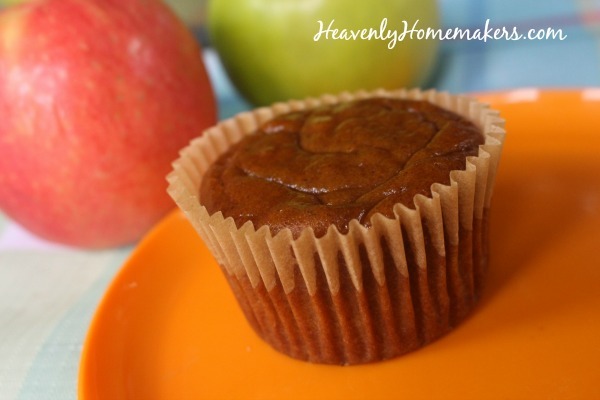 These include creamy almond butter, which makes these Flourless Pumpkin Muffins such a great start to the day! I mix these muffins in my Blendtec, simply because it means I can throw them together so quickly. I blend the batter, then pour it into prepared muffin tins. Easy and awesome! Blend all ingredients together in a blender or with a hand mixer until smooth. 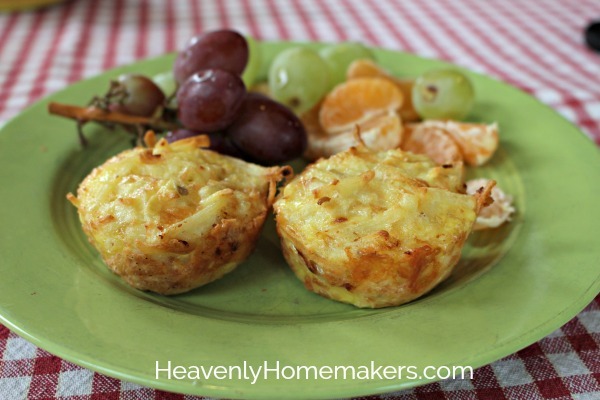 Scoop batter into 18 paper-lined muffin tins. Bake in a 400 degree oven for 20 minutes or until golden brown. 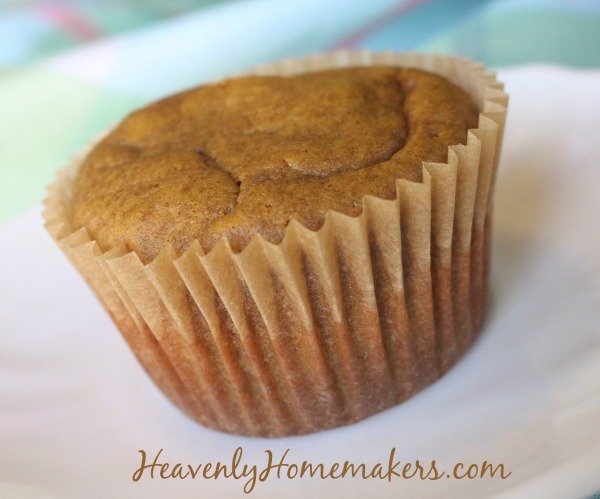 *Find the recipe for our Pumpkin Spice mix here. Or substitute: 1 teaspoon ground cloves, 1 teaspoon cinnamon, and 1/2 teaspoon nutmeg in this recipe. 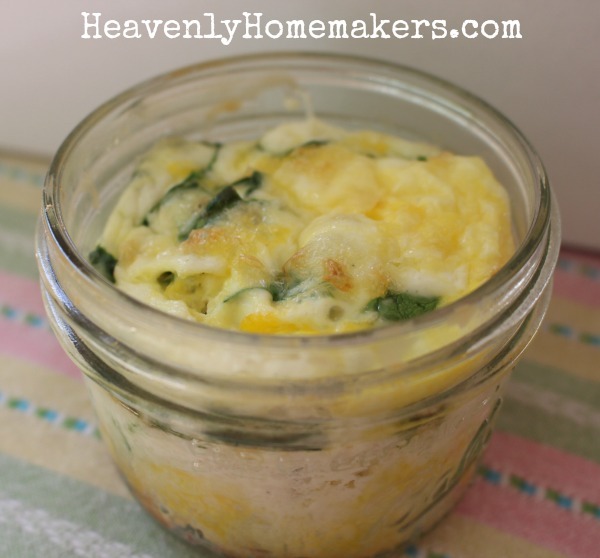 If we can bake Quick Bread in a Jar we can certainly bake Mini Crustless Quiche in jars. Check this out! You would think so. But these quiches actually taste good cold. Or, if you have the ability to rewarm them, that’s great too. <— Laura states the obvious. Just like so many Lunch in a Jar ideas we are sharing this month, these Mini Crustless Quiches can be made to order. Add or exclude whatever your family likes. 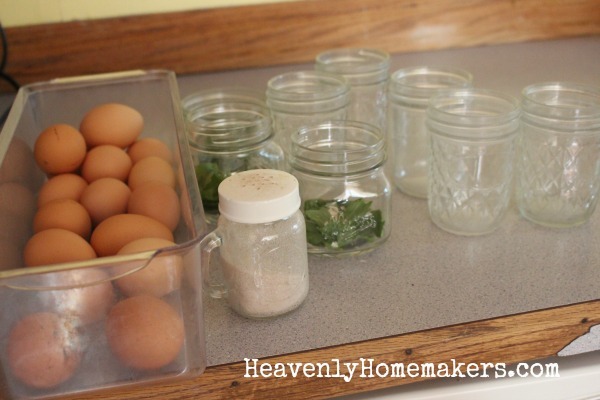 It’s super easy to line up several jars and fill them using an “assembly line” method. 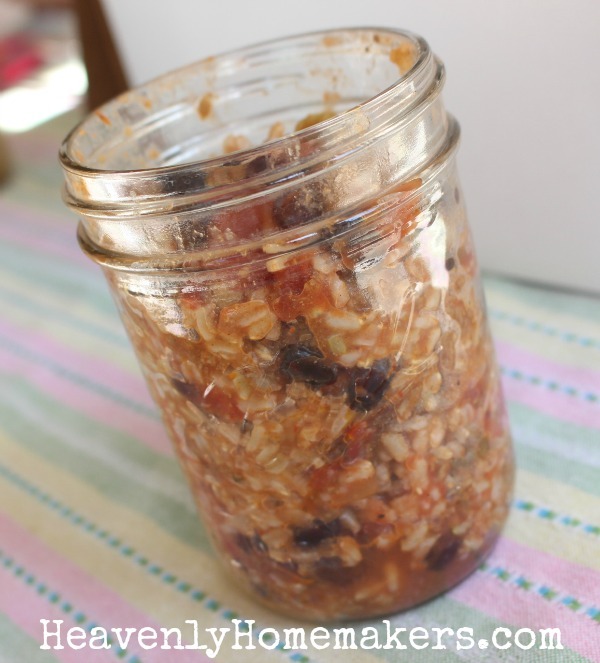 If you have cooked meat, put some in each jar per people’s preferences. If the kids won’t scream too loud about it, add some fresh spinach. Crack in 1-2 eggs per 8-ounce jar (1 if you have a lot of add-ins, 2 if you are more focused on eggs than meat/veggies/cheese). Add in any goodies you like: onions, sweet peppers, shredded cheese, cooked sausage, cooked bacon, chopped ham, leftover chicken – the options are only limited to your preferences and what you have on hand! I recommend 8-ounce wide mouth jars for each Mini Crustless Quiche as they are easier to clean afterward. But truly, any 8-ounce jar will work! Crack 1-2 eggs into each 8 ounce jar. Add cream or milk, salt and pepper, plus any add-ins you like. 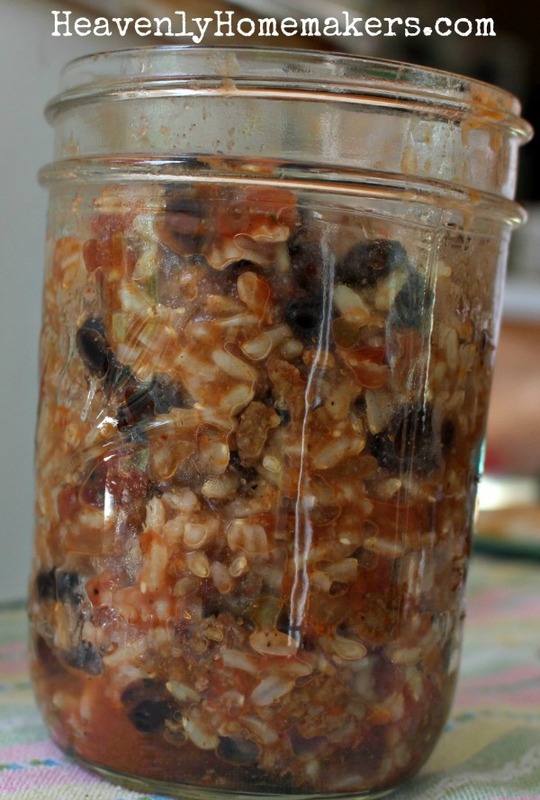 Use a fork to scramble the contents together in the jar. Place jars on a cookie sheet. Bake for 30-40 minutes in a 350 oven until contents in each jar have puffed up and cooked until the middles no longer "jiggle." Even my pickiest kid loves these – even with the spinach!! Score! 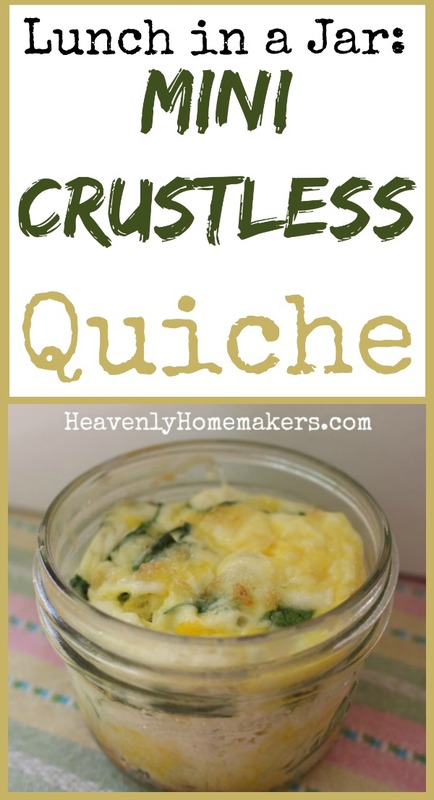 What are your additional suggestions for Add-Ins for these Mini Crustless Quiches? We’ve got 10 super fun Lunch in a Jar ideas to share this month – perfect for your Back to School lunchbox! Subscribe here so you won’t miss a post! Today’s “Lunch in a Jar” idea might sound like a strange one. But trust me when I say that a Burrito Bowl packed in a jar and taken on the road or for a work or school lunch is extremely tasty! It’s also wonderful because it’s a great change of pace if you’re tired of sandwiches or other “normal” sack lunch foods. We’ve found that a Burrito Bowl packed in a jar tastes great hot or cold. So if you have a way to warm up your food at work or school, go for it! But if not, this Burrito Bowl will still taste great as is! The beauty of the Burrito Bowl is that it can be made per each person’s preference. Not a fan of olives? (Me neither.) Leave them out. Love extra spice? Go nuts with the salsa or hot sauce! Everyone can build their Burrito Bowl the way they love without any extra effort! Each person can fill their bowls or jars any way they like. Stir it together and you’ve got a great meal. Make several jars ahead of time to pull out and pack to go as needed! 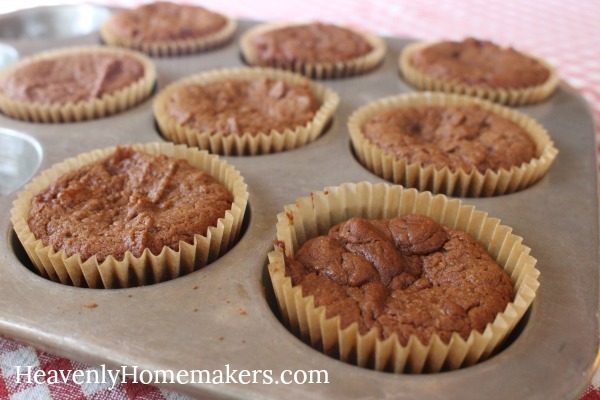 Super Moist Flourless Brownie Muffins – Perfect for a Lunch Box! Would someone please stop me from eating all of these Flourless Brownie Muffins? Just kidding. I’d actually like to keep eating them. And also, I can let the kids eat all the Flourless Brownie Muffins they want because there is no reason to hold back on these. Want a brownie for breakfast? Sure! Want three more brownies? Okeedokee. Ran out and need to bake more brownies? Shucks, don’t mind if I do. I’ve been trying to trouble shoot and solve the mystery of this, because these recipes turn out great for me every single time! Is it my oven? It can’t possibly be that my oven works in these recipes and all other ovens don’t. Is it the temp? The time? I do believe it’s the time. I shortened the baking time in the instructions, hoping that will make a big difference. I believe the trick to turning out perfect Super Moist Flourless Brownies is to pull them out of the oven when they are slightly underdone. If they bake too long, they will become dry and taste like burned nut butter. Meh. So during my time of tweaking and trouble shooting, it occurred to me that I should try baking this recipe in muffin cups. Perhaps that would turn out Super Moist Flourless Brownie Muffins, I thought. Maybe if this recipe was baked in muffin cups, we could bake them for less time and avoid drying out our brownies. As for baking time on these Super Moist Flourless Brownie Muffins, I’m going to recommend 12-15 minutes. They may look slightly underdone when you pull them out. But this is what will keep them gooey and delicious! 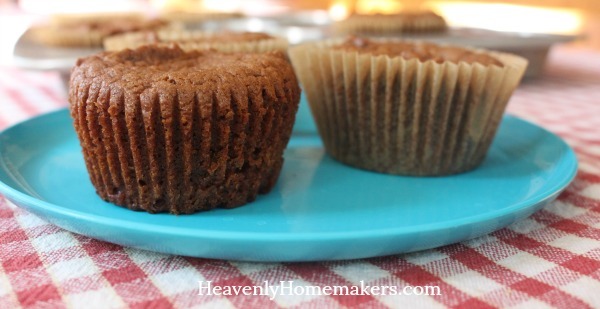 Super Moist Flourless Brownie Muffins - Perfect for a Lunch Box! Scoop batter into 12 paper-lined muffins cups. 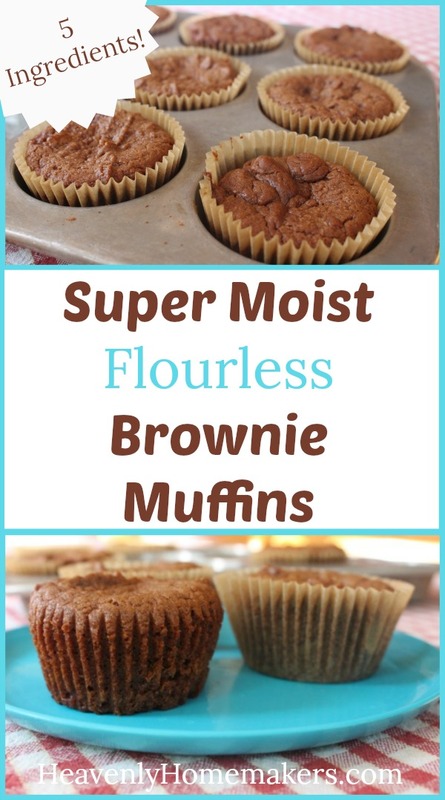 I felt this recipe was worth sharing in the middle of my Lunch in a Jar series simply because these Super Moist Flourless Brownie Muffins are perfect for your Back to School Lunchbox! They are filling, nourishing, and fun! I am about to introduce you to The Most Amazing Flourless Chocolate Cake. 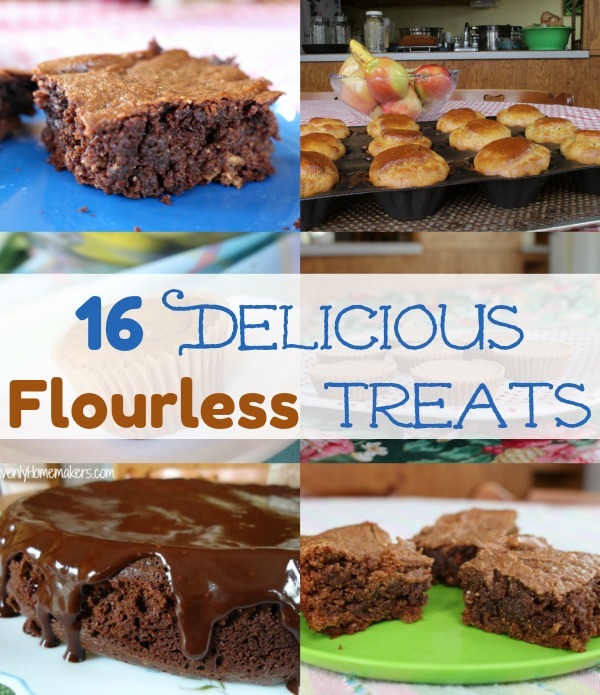 Why do I sometimes share flourless treat recipes? Because we can all stand to eat fewer grains. (But apparently I’ve decided that chocolate is still a necessity.) It’s also fun to bless the gluten free or grain free eaters among us. 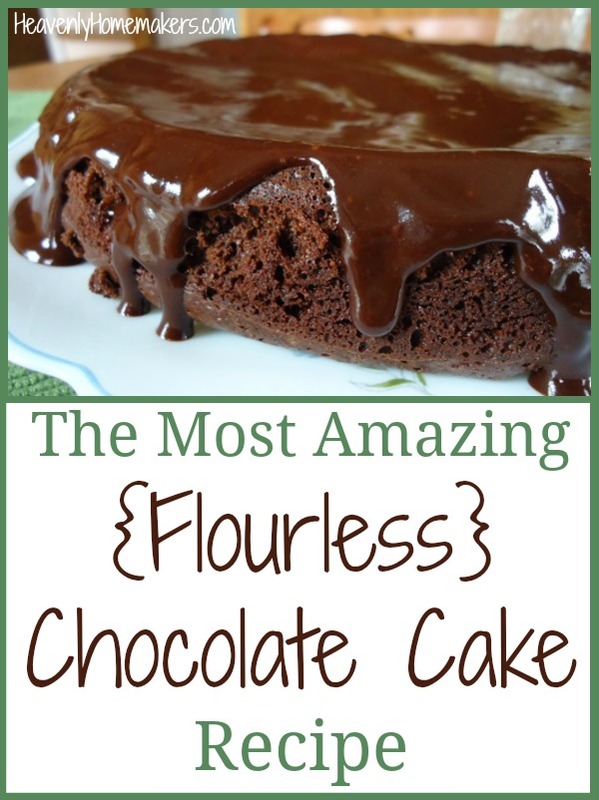 And I promise you this: EVERYONE will be blessed by this Amazing Flourless Chocolate Cake recipe! I’m finding that flourless=moist. How about that? Want more of our family’s favorite flourless treat recipes? Here you go! Now how about the most Amazing Flourless Chocolate Cake? I will warn you that while most of the recipes I share now are 1-step, simple as can be recipes – this Flourless Chocolate Cake is a bit more involved. Worth it? Oh, it is so worth it. I got this recipe years ago from my friend Kim and it is truly incredible! Preheat oven to 375°. Butter a 9-inch spring form pan, then line the bottom with a circle of parchment paper. Butter the paper, and set the pan aside. Place two-thirds (8 ounces) of the chocolate and 1 cup (2 sticks) of the butter in a medium saucepan over medium low heat. Stirring often, melt chocolate with butter until completely blended. Remove from heat and transfer to a large bowl. Add sucanat and mix well. Add eggs one at a time, whisking well after each addition. Sift cocoa into bowl and stir until just blended. Pour batter into prepared pan and bake for 35 to 40 minutes, or until cake has risen and top has formed a thin crust. The cake should be just firm in the center when done. Cool for 10 minutes, then invert onto a plate, removing sides of spring form pan. Remove and discard parchment paper and set cake aside to cool completely. 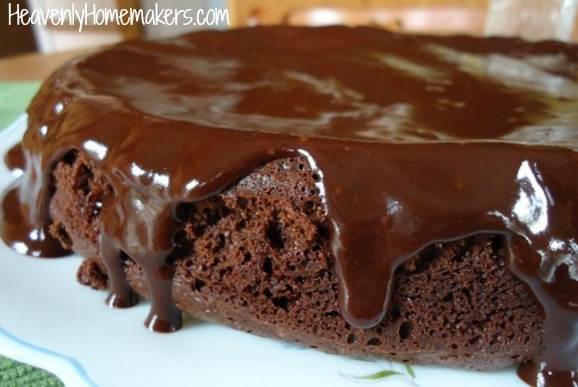 While waiting for the cake to cool, make the chocolate glaze. Melt remaining 4 ounces chocolate and 3 tablespoons butter in a small saucepan over medium low heat, stirring until smooth. Remove from heat, then stir in milk, honey and vanilla. Set aside to cool slightly. When cake has cooled, pour glaze onto the center. Using a spatula or the back of a spoon, smooth the glaze very gently along the top and sides of the cake. Chill cake, uncovered, for 30 to 60 minutes before serving to set the glaze and make the cake easier to slice. Like the old saying goes, when life gives you Super Moist Flourless Brownies, switch the almond butter for peanut butter and turn them into Super Moist Flourless Peanut Butter Brownies. I admit that I often get on recipe kicks at my house. We discover a new recipe we love and we make it thirty times in forty days because we can’t get enough. (Sometimes, but not always, I exaggerate.) 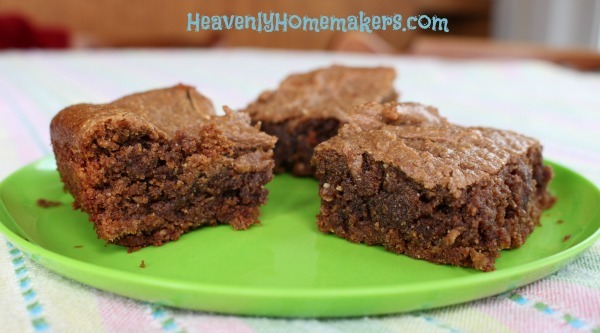 So it is with both varieties of these Super Moist Flourless Brownies. They are so incredibly good that we have gone through a ridiculous amount of Almond Butter and Peanut Butter in the past month and a half. There goes the grocery budget. Well, only sort of. After all, both of these brownie varieties are super wholesome and full of protein. So I’ll put out a pan of these for breakfast (no one complains, mind you) and because they are so rich and filling, there’s no need for me to add meat to the meal. Therefore, we’re subbing nut butter for bacon on days like this. Money-wise, it’s kind of a wash. Taste wise, well, we love our bacon, but the trade off is brownies. So everyone is happy. 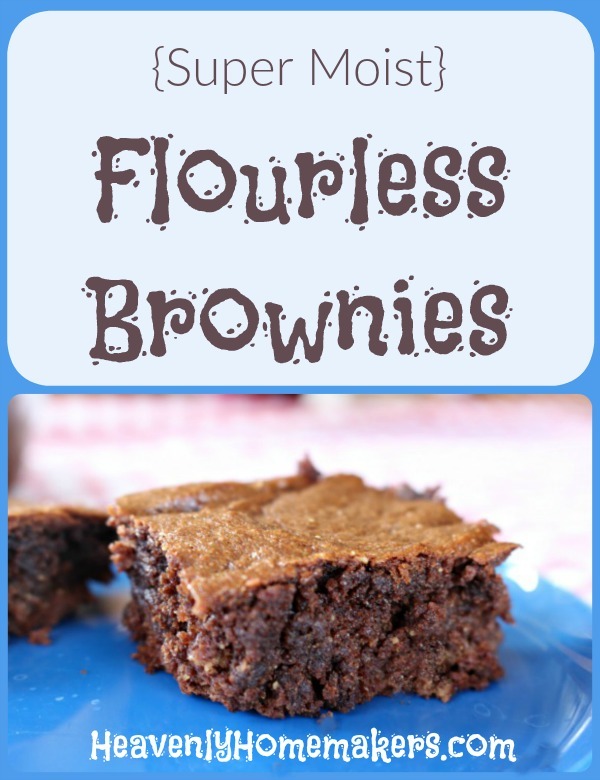 If you’ve tried the Super Moist Flourless Brownie recipe (only 5 ingredients!) you’ll look at this one and notice that the only difference is a direct exchange of peanut butter for the almond butter. It’s too easy! But here’s the thing: The tiny ingredient switch makes for a significant flavor change. 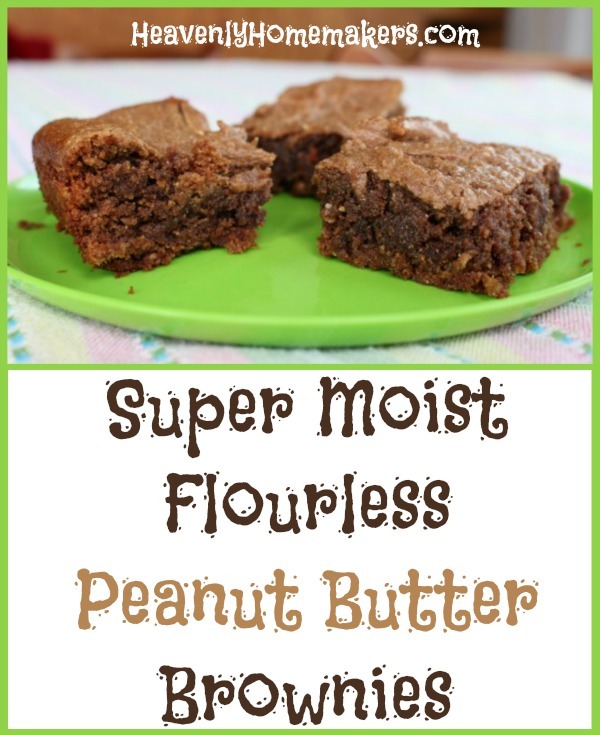 This Super Moist Flourless Peanut Butter Brownies recipe really turns out a treat with the awesome peanut-butter-chocolate taste so many of us love! The Super Moist Flourless Brownies recipe made with almond butter taste like regular, but amazing, brownies. So we love both. A lot. Like, I’m buying cases of Almond Butter just so we can make brownies. I can’t help it. I consistently make Homemade Peanut Butter, which does save a few pennies, but mostly just produces the most amazing peanut butter in the whole wide world. 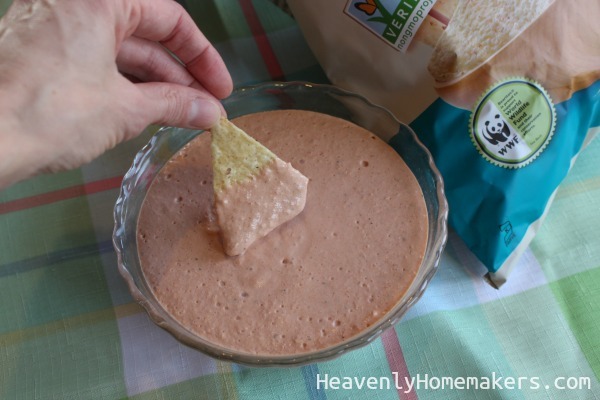 This one is super creamy and spreadable, our favorite. This one is made with straight peanuts, also incredible. Both are nourishing. I have experimented with making Almond Butter but for the most part, I buy it already made. Whether you make or buy your nut butters, I recommend using unsweetened, natural butters in these recipes. Spread batter into a buttered 8x8 inch baking dish. Can you believe, these brownies have taken the place of my Fat Bombs for now? Depending on the day. I guess it’s apparent I really like my chocolate and my peanut butter, in all its healthy forms. Want 111 more recipes that include 5 or fewer real food ingredients? Here’s our best collection! I love the idea; I think it is beautiful. What a fantastic way to sneak in fruits and veggies by adding them to our treats! But I’ve tried the banana-peanut butter-cocoa powder ice cream and I just can’t make myself like it. The same is true of the pancakes made with only bananas and eggs. Chocolate pudding made by blending avocados? I just can’t. Am I picky? I like to think not. For goodness sake, I’m the girl who eats fresh spinach straight out of the container as a snack (basically this is me being too lazy to actually take time to get out bowl and a fork). So picky I am not. But I just can’t get into eating blended frozen bananas that are pretending to be ice cream. The ingredients in these Super Moist Flourless Brownies won’t even shock you. There’s no secret ingredient that will cause you to cringe or question whether or not your family might actually try one. You’ll be wonderfully amazed! 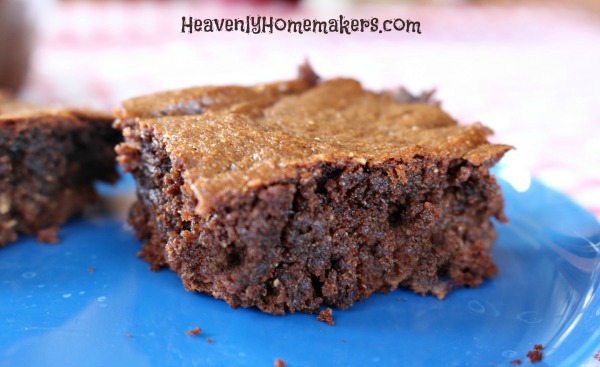 These brownies actually have the taste and texture of brownies that come from a box, only of course, the real food ingredients make them even more delicious! My kids took a bite of these and couldn’t believe that these brownies were “actually healthy.” Our first pan lasted a very short time. Look at these ingredients! How good can we feel about feeding these brownies to our kids? Good enough to serve them for breakfast? Absolutely. Can you sub out peanut butter for almond butter? I don’t know why not. In fact, I think that would create a delicious chocolate-peanut butter brownie worth writing home about. 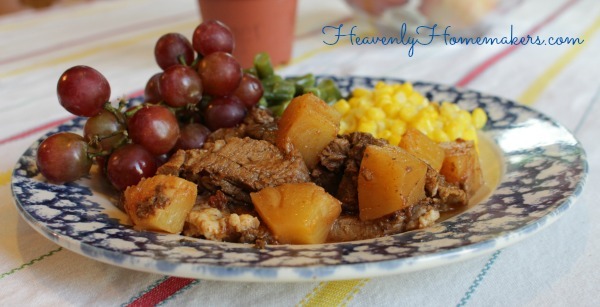 Enjoy the simplicity of this recipe! Get excited about the nourishment and energy the brownies provide. Savor eating brownies for breakfast with your morning coffee. Delight in the fact that there are no bananas involved in the making of this treat. As for me and my house, we’ll save the bananas for creating smoothies and banana bread. Also, I’ve got to be sure you all see this incredible deal that is only being offered a few more days! 6 eBooks for $6!! 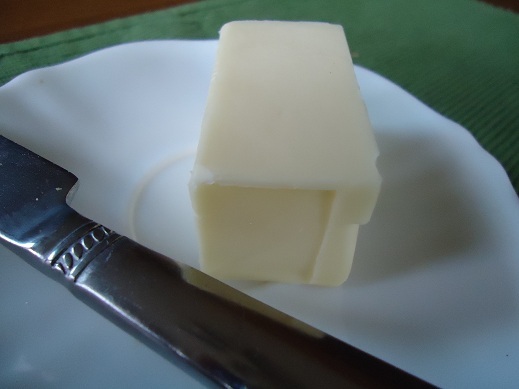 Ready to simplify your kitchen life? 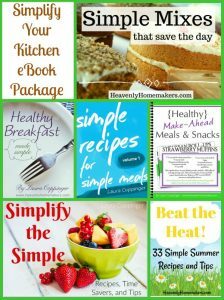 These six eBooks will give you hundreds of simple recipes and ideas to help you feed your family well while spending less money and time in the kitchen! Gluten intolerance has become a big issue in America. I could go into all the reasons for this, but for now, let’s just thank Jesus for being our bread of life. 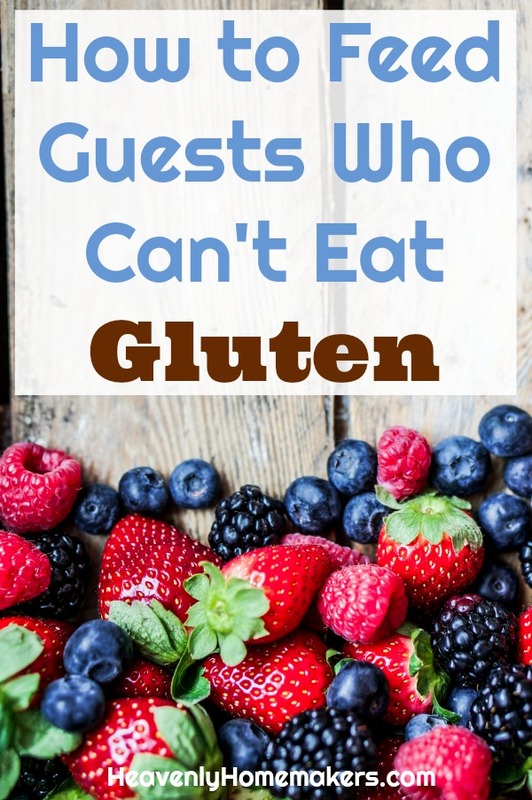 :) Regarding this very serious gluten situation, when serving food to friends or family members who can’t eat gluten, it is very important that we know how to extend hospitality so we can prevent our guests and loved ones from becoming sick. Sick?? Yes. While some simply experiment with eating gluten free to see if it is a diet that helps them feel better or lose weight, there are some who have a solid diagnosis of Celiac Disease or other gluten intolerance that mean that they must avoid all gluten, all the time, no matter what. Truth: A person with Celiac Disease can’t eat even one tiny morsel of something that contains gluten without getting sick. We’re talking about sauce that has been thickened with a tiny bit of wheat flour, chicken that has been breaded with crushed wheat crackers, or even a small nibble of communion bread at church. There’s no such thing as “don’t worry – this only has a little bit of wheat in it” when it comes to feeding someone who must eat gluten free. For these people, gluten free eating isn’t an option, it is a must. Sooooo, be aware of this and be cautious! But don’t be afraid. I’ve learned over the past decade how to easily feed my friends who can’t eat gluten. I don’t even need to buy special food to do this! I simply cook regular food, making sure to read all labels and avoid wheat, oats, barley, and rye. You’d be amazed at how many foods are naturally gluten free! When in doubt stick with meat, fruit, and veggies. 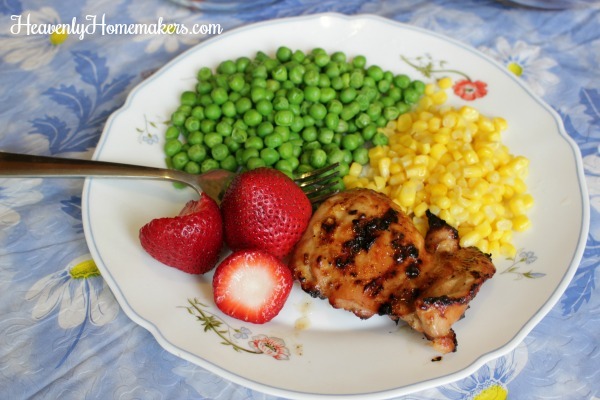 For more ideas, check out this huge list of simple meal ideas! They are gluten free without even trying! Previously opened ingredients: There might be wheat bread crumbs in your jar of peanut butter or on a used stick of butter. Start fresh to be sure your food isn’t contaminated with gluten! Baking stones and cast iron: These can absorb gluten, so it’s best to use stainless steel or glass pans and bowls. Wooden cutting boards and wooden spoons: Again, these can absorb gluten. Use stainless steel utensils and a plastic cutting board instead. If you want to serve bread with your meal for guests who can eat gluten, place it away from the food that is gluten free. It’s a good idea to cover a baking pan with parchment paper before putting food on it in an effort to protect it from gluten contamination. If you use your blender or mixer, be sure to wash it thoroughly first. Don’t be offended if the person you’re feeding asks to see packages, ingredients lists, or if they ask specifics about how something is cooked! Their health depends on it and they must be assured that the food they are eating is safe for them! Gluten Free Friends: What are your favorite meals? Are there any other tips you’d appreciate the rest of us knowing about? Remember, cooking gluten free food truly isn’t difficult once you realize how many thousands of food options there are that are naturally gluten free. Again, be cautious and courteous, but don’t be afraid. You’ll find that making gluten free meals really is as easy as cooking meat, steaming veggies, and slicing fruit!